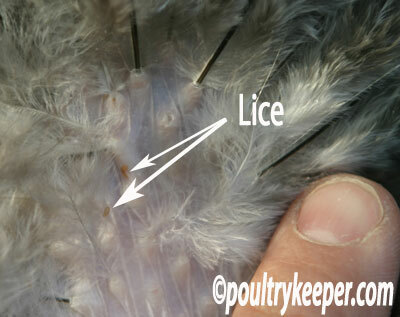 There are several types of biting lice that affect chickens and other poultry. These are known as ecto-parasites or external parasites as they live on the outside of the bird. Lice are between 1 to 4mm long depending on the type of louse. They can be found crawling on the bird at the base of the feathers but are fast-moving so soon move out of the light when feathers are parted. They spread from bird to bird by direct contact and clumps of eggs are usually found at the base of the feathers below the vent. Off the bird lice can survive for a few days so although less likely, can also spread from bird to bird via the hen-house or litter. Most chickens will have a few lice on them from time to time and won’t be particularly bothered by them but it’s important not to let the numbers get out of control or they will be causing severe irritation and feather loss as they over groom, trying to rid themselves of them. On chickens it is usually Menopon gallinae that infects them. These are a straw-yellow colour flat louse about 2mm long. They are fast-moving – if you part the feathers you can see them run for cover amongst feather shafts. 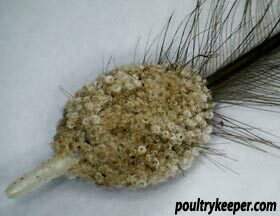 Waterfowl usually suffer with shaft lice Holomenopen spp which are dark, thin lice. They are longer around 4mm but again soon dash for cover when exposed. They can be found on feathers close to the shaft as well as on skin. Due to their colour, they are quite hard to spot on dark coloured birds. The photo to the right shows louse eggs (called nits) firmly attached to the base of a feather shaft, found below the vent. These will take up to 3 weeks to hatch. Often, these can be confused with a slightly ‘messy’ bottom and it isn’t until you take a closer look that you can recognise them. The photo below shows an area below the vent which is typical when a hen becomes infested with lice. 1 to 4mm fast-moving lice at the base of the feathers. Nits stuck to the feather shafts below the vent. Nits are very hard to remove, although with care and a little warm soapy water, they can sometimes be broken off with the fingernails bit-by-bit. 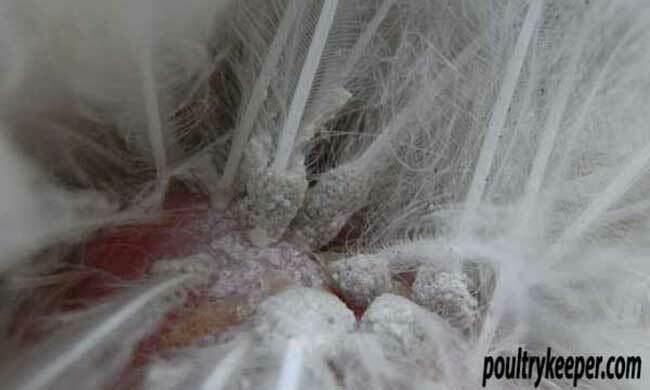 If there are a lots of nits, it is often easier to wait for them to hatch and kill the lice by using a powder approved for dusting on hens or by using drops of Ivermectin on the back of the neck under the guidance of a Vet which is detailed below under ‘Treating Lice’. Chickens will keep the number of lice they are carrying down with dust baths and preening, Diatomaceous Earth can be added to the dust bath which will help, although make sure it isn’t too dusty because chickens are prone to respiratory problems. Inspect ex-battery hens that have had their beaks trimmed (de-beaked) regularly, since they cannot preen themselves very well so are more likely to become infested with lice. Avoid contact with other birds that have lice. Check newcomers to the flock and dust them down with a louse powder as a precaution before introducing them. If you are showing poultry, always dust birds down on their return during their quarantine period. Ivermectin is by far the easiest way to remove lice on chickens, it also kills most common poultry worms and has a residual effect once applied, however it is unlicensed for use on poultry and avermectins are more toxic to waterfowl so you should only use it under the guidance of your Vet. The life cycle of biting lice is around 3 weeks – so it is important when using a product to remove them that you re-check regularly and re-treat as necessary after a week as most products will not kill their eggs and these will hatch producing egg laying adults in a 3 week period.